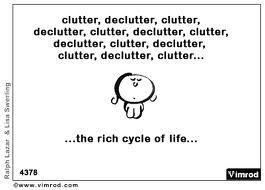 This week I’ve had a good spring clear out and my home feels like it can breathe a sigh of relief again. I find it incredibly cathartic to put my home in order, getting rid of things that are just cluttering up the place, keeping things neat, tidy and ordered! It started after scrabble friend confronted me about my lax attitude towards money and gave me the sharp truth about how I would end up in financial difficulties if I carried on the way I was going and the importance of taking control of it now. I was impressed with his perception about something I hadn’t particularly discussed with him and his ability to have the conversation with me in such a way I heard and accepted what he said without feeling judged or criticised. He was right, I knew he was right and it was something I had been burying my head in the sand about. The truth is, I have never been fully in control of my finances, never paid much attention to keeping to a budget and have always been in debt. My financial situation is something that shames me, I feel it is something I should be in control of and after all the time I’ve invested in trying to get my life in order it is kind of shocking the lack of attention I’ve paid to this area of my life. When scrabble friend came into my life I knew we were meant to be in each others lives, we had a purpose for each other. I am so grateful to him for so many reasons, he has been such a lovely addition to my life and what’s more it appears the feeling is mutual 🙂 We’re not going to be partners for life, but we are involved in each others lives at the moment and it’s a good thing. Getting in control meant confronting the paperwork that has been mounting up and carefully stuffed into bags and shoved under the bed. In doing this I discovered the box of tapes that I had stored there 15 years ago and it was as if a switch went off in my head and the need for a clear out began. I have always been quite an ordered person, as a child I thrived on keeping my stuff neat and ordered, controlling my environment in the only way I could. I have never attached too much sentiment to objects, they are transitory items that can be broken and lost. I’m also not a hoarder and know that what looks like chaos to me would look pretty ordered to other people! It is all relative, there is no point judging against others as it’s is all about what works for me. The tapes under the bed were at last thrown out, the video’s that can no longer be played because the player has long gone went into the bin and I culled some of the objects that I have acquired and loved over the years but no longer need to gather dust on the shelf. It was a great feeling having that ruthless head on that just enabled me to de-clutter. My home still feels full but it feels ordered and with space to breathe. I feel as if at long last I am getting in control of my life, I’m learning to let go of that I can’t control and take charge of that I can. Where I always felt that I had to be self sufficient and not lean on others, I’m learning that a helping hand can make all the difference. I have had a therapist help me get my head in order, a GP and weight loss surgeon help me get my health in order and now scrabble friend is helping me get my finances in order. I am so grateful for this help, I know it is what’s enabled me to live my life and strive to make the most of it. 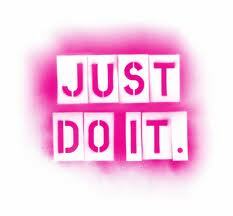 The message they have all given me and encourage me to follow is ‘just do it’. Stop thinking about it, analysing it, becoming frightened by it, protecting myself from what distress it might or might not bring and just get on and do it! We have only one chance at life, it doesn’t matter what’s been the only thing that matters is embracing the challenge of living, making the most of the opportunities that come our way and dare I say it, listening to the wisdom of those influential people in my life and just get on and do it!